Brief Description: Are all you ardent Celtic fans up to this challenge? Pit your wits against 1,500 wide-ranging questions about your beloved team, and get ready to step up a gear as you progress to the last section, designed to test even the most knowledgeable expert among you. You may know your Henrik Larsson from your Liam Brady, but do you know your Yogi from your Shuggie, or your Jambos from your Jags? Covering the history of the team, players and managers, championships, squad numbers, former clubs, opponents, specific seasons, transfers, trophies, opponents, league positions, nationalities, nicknames, leading goal scorers and award winners, there’s something to baffle even die-hard aficionados. Containing a wealth of information, it is as much an excellent reference book of facts and figures as it is a quiz book, and it is guaranteed both to entertain and to stir up memories of unforgettable moments in Celtic’s history, as well as the personalities that have made the Club what it is today. Special Note: £1 from every copy of the book sold will go to 'The Motor Neurone Disease Association' Charity. 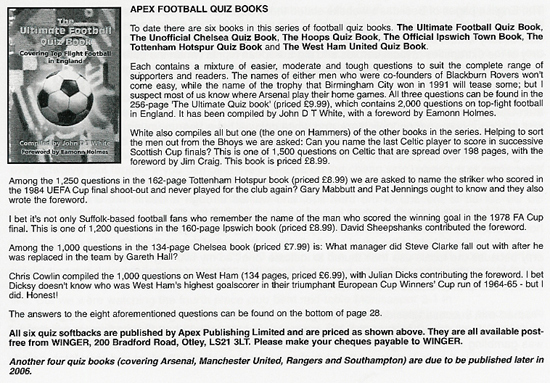 Questions from this book were used in the 'AllAboutFootball' Official Celtic Edition board game. This book is also available as an ebook. 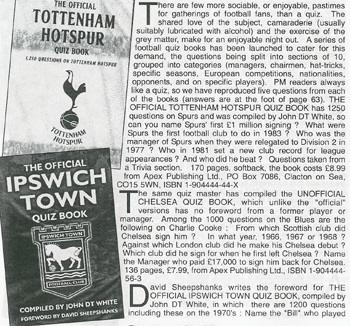 When John White first got in touch and explained about his quiz book, I must confess that alarm bells started ringing. All through my career, I have been asked to assess various books about Celtic, very few of which lived up to expectations. However, when John e-mailed me the details, I was very pleasantly surprised. This is an impressive piece of research. John has put in an enormous amount of work to collect and collate all the different questions. Some of these cover all the famous moments in the club’s long and illustrious history, which gives every Celtic fan the chance to learn more about the Hoops or merely refresh his or her memory. In addition, there are various sections dealing with individual eras, players and managers, so no matter what age the reader is, there will be a subject he or she will feel comfortable with. The questions are well laid out and the answers easy to find. All in all, the book is a welcome addition to the club’s range of literature and will go down well with the huge Celtic support. From a personal point of view, I did pretty well in answering many of the questions relating to Celtic’s history and personnel from its inception in 1887 until around the year 1990. From then on, I did not star but, my goodness, reading the answers for that period has really improved my own knowledge of the last 15 years! And don’t forget, £1 from every copy sold goes to the Motor Neurone Disease Association, an organisation close to the heart of my old colleague, Celtic’s Greatest-Ever Player, Jimmy Johnstone. A must read book for all Celtic fans who want to know, and test, their knowledge about our great club's magnificent history. I'm delighted that £1 from every copy sold will be donated to the Motor Neurone Disease Association. John’s book is a magical trip through the glorious history of Celtic Football Club. I am honoured to have played for Celtic during my career, signing for the club as an 18 year old in August 1957, and I fondly remember my 6 years at Celtic Park. The club holds so many special memories for me both as a player and as a fan and John’s book has helped rekindle those wonderful times. This book really is a must for all Celtic fans because just by asking each other questions from it you will gain an insight into the history of the club and learn so much more about one of the greatest club sides in the world. My own favourite memory has to be watching the wonderful Lisbon Lions lift the European Cup in 1967. The Motor Neurone Disease Association provides advice and support for people with MND as well as funding and promoting research into the disease. We depend on voluntary donations to fund our work and so are delighted to be benefiting from the sales of this book. Now Celtic fans can test their knowledge of their favourite club and support people with MND at the same time. Text NBN with the answer and your name to 07887 995588 for your chance to win. John White, compiler of a new quiz book on Celtic, has very kindly offered scottishleague.net three copies as competition prizes. Details of how to enter will be posted later. In the meantime John has asked us to let everyone know that £1 from the sale of every book will go towards fighting Motor Neurone Disease. As many will be aware this is a condition which afflicts one of Parkhead's greatest ever players - Jimmy Johnstone. Calling all Celtic fans in Ireland: Think you know everything about your favourite club. 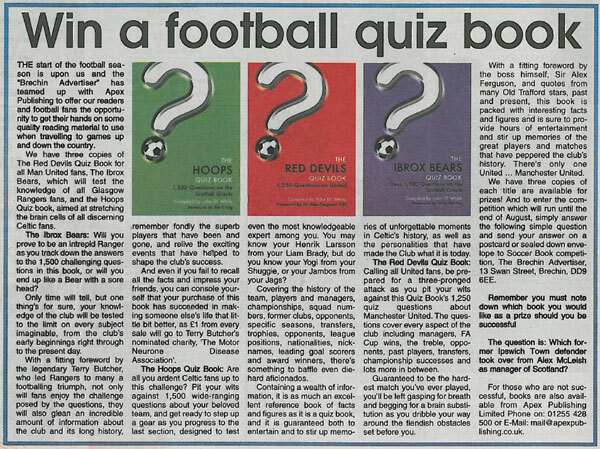 Well, the excellent "The Hoops Quiz Book" will soon determine your knowledge on one of Europe's most famous clubs. Everything from Liam Brady to Celtic's performances in Europe against Portuguese and Dutch teams is covered in this beautifully presented production. "The Hoops Quiz Book", written by Irishman John White, is an ideal gift for any Celtic supporter and is an ideal way of testing how much your friend really knows about the 'Bhoys'. 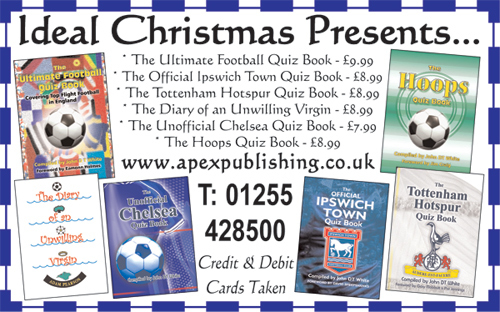 Thanks to John and Apex Publishing, a2zsoccer has got their hands on five copies of the book. To be in with a chance of winning a copy, we have chosen a question out of the book for you to answer. What was former Republic of Ireland international and Celtic manager Liam Brady's nickname during his playing career? Please send your answer along with your name and address by email to info@a2zsoccer.com. £1 from every copy sold goes to the Motor Neurone Disease Association, an organisation very close to the heart of Celtic legend, Jimmy Johnstone. Copies of the book can be purchased by logging on to Apex Publishing. "John has put in an enormous amount of work to collect and collate all the different questions. Some of these cover all the famous moments in the club's long and illustrious history, which gives every Celtic fan the chance to learn more about the Hoops or merely refresh his or her memory," said Craig. John White and Apex Publishing have also produced a number of other sporting publications, which will be bringing you news of in the coming weeks. 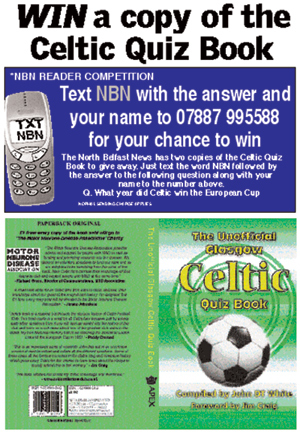 Help the Motor Neurone Disease Association by buying The Hoops Quiz Book by John White. In it you will find the Foreword is written by Jim Craig and there are also quotes given to John by Wee Jinky. If you want to try to win a copy of this great book answer the questions below, reply right here in this topic with your answers. The winner will be drawn out of a hat of all the correct answers at kick-off of the first game of the new season on the 30/7/2005 at 12:30pm and they'll win a copy of the book. Jimmy Johnstone was known as “Jinky” in Scotland but by what nickname was he known in Eastern Europe as a result of his dazzling performances for Celtic across Europe? Who won the most caps for Scotland as a Celtic player, i.e. when he was a Celtic player and not at any other Club? Who was the last player to score a hat trick in an Old Firm game? Who was the last Celtic player to score in successive Scottish FA Cup Finals? What Celtic striker was the first non-Scottish-born player to score a hat trick in a Scottish Cup Final? Who was the first non-Catholic Manager of Celtic? Can you name the Celtic defender who during his first season at Celtic Park went to the African Nations Cup with the Ivory Coast and ended up being held at gunpoint by the country’s military following a series of poor results? Over the space of 3 days during 1993, Celtic had 3 different Managers. Name any 2 of the 3. Can you name the Brazilian striker who was released by Borussia Dortmund in May 2004 and spent a few days on trial at Celtic Park? With what Tottenham Hotspur player were Celtic linked in May 2004? What prominent UEFA Official was one of the men who urged Henrik Larsson to end his International retirement? What company was Celtic’s shirt sponsor in season 1997-1998? What English Club has Celtic met in European Competition on 3 separate occasions? Who is the only Celtic player to have been capped more than 100 times by his country? Keep The Faith is delighted to have the opportunity to help publicise and promote The Hoops Quiz Book, written by John White. With donation going to the Motor Neurone Disease Association from every copy sold, and with Celtic Legend Jimmy Johnstone's endorsement of the book, Keep The Faith advises everyone in Timdom to buy several copies. 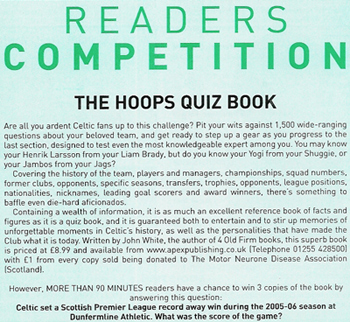 The Hoops Quiz Book is the ideal accompaniment to your summer holiday. What is the name of Celtic’s manager? E-mail the answer to sport@dailyireland.com by 3.00pm Friday, August 5th, 2005. When it comes to the inevitable “who’s the biggest tim” debate that you always seem to get into with your mates, an important aspect is your knowledge of Celtic trivia. “Who did Ronnie Simpson start his footballing career with? Who was Andrew Kerins? What have I got in my pockets?” These are all questions that inevitably come up when two or three tims get together, admittedly usually with a drink or two being taken. It’s all part of the fun really isn’t it? The questions are arranged in groups of ten per page with each page having a specific theme, “Moving on”, “Paul Lambert”, “Season 1999-2000”, etc. There is a smashing range to the questions and White has clearly worked hard to make the book accessible to all ages. The questions gradually increase in difficulty as you turn the pages with the final couple of hundred being fiendish in the extreme. It’s also worth noting that the questions cover the entire history of the club right up to the season just past. This allows younger readers to enjoy questions concerning for example season 2000-2001 and even Henri Camara. It’s a pleasant change from the usual quiz books that seem to revel in just how obscure they can be. This is an engaging way to learn more about the club history and test your knowledge of it. In fact it’s akin to having a pub quiz in a book. Obviously though you don’t have to nip to the toilets to text your mate for the answers. Not unless you really want to that is. Part of the challenge when presented with a book of this type is checking it for errors. There’s a perverse satisfaction attached to discovering that the quiz master isn’t quite as smart as he thinks. Disappointingly, such is the level of care taken with this compilation I could find no such error. And if all that’s not enough of a recommendation for you Apex are donating £1 to Motor Neurone Disease research for every copy sold. You can obtain a copy by clicking here. All in all this is a great book to pass the time with. It’s not something that you’d want to sit and read from start to finish but rather it works best in small doses. Any supporters club struggling to fine a way to keep the punters occupied on the long trips to Aberdeen, or abroad, could do worse than pick this wee gem up. It’s a great opportunity to discover just who knows the most about our great club. I defy anyone to know the answer to every question contained therein. And when all is said and done you can’t ask for much more in a Celtic quiz book than that. Oh and by the way Alex Boden was the only Celtic player to have played in a Scottish League v. Welsh League game that took place in Cardiff in September 1952. But, of course, you knew that already didn't you? 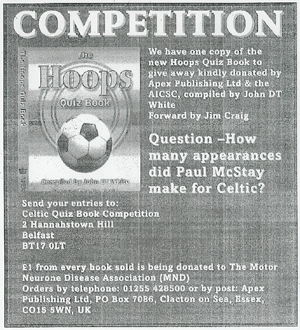 Your chance to win The Hoops Quiz Book. This is your chance to own a copy of the brand new Celtic book, entitled 'The Hoops Quiz Book: A Quiz Book About Glasgow Celtic Football Club,' by John White. The book's foreword was written by Jim Craig and there is also quotes from Jimmy Johnstone. It is for available to buy for £8.99 at http://www.apexpublishing.co.uk/PubDetails.asp?Num=56 and £1 of each copy sold will be donated to the Motor Nuerone Disease Association. Come On The Hoops have two copies of the book to give away, and this is your chance to win a copy of the book. To enter, simply send us a short account of your greatest game as a Celtic supporter. The top two entries will win copies of the prize. Please send entries to coth5@hotmail.com, along with your name and address. So you think you know Celtic? I thought I was quite knowledgeable about football and in more recent times certainly more in the know about Scottish Fitba. I was recently asked to review a quiz book all about the Glasgow giants, Celtic compiled by John DT White. I thought I could answer most questions about The Hoops but how wrong I was. John has compiled 1,500 questions in this comprehensive quiz book which covers history and the more recent successes. Paddy Crerand writes, “This is a magical trip through the glorious history of Celtic Football Club and is a must for all Celtic fans”. Paddy’s own favourite memory, which I guess is many fans favourite too, is watching the Lisbon Lions lift the European Cup in 1967. The big plus too is that for every book that is sold the Motor Neurone Disease Association will receive £1. Celtic fans can test each others knowledge on their way to games on the coach and you will be surprised how much you don’t know. A must read for all Celtic fans. The Greenock Telegraph have one to give away to the first correct answer drawn at random to this question. If you are not lucky enough to win this book well pop down to the local bookshop and order yours in time for Christmas. 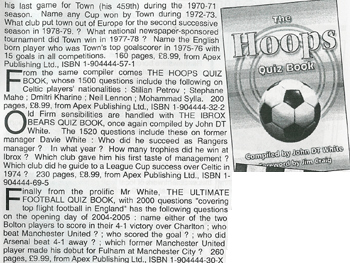 The Hoops Quiz Book, by John DT White with a foreword by Jim Craig costs £8.99 and is published by Apex. ISBN 1-904444-34-2. 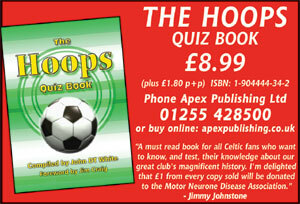 * The Hoops Quiz Book, by John DT White with a foreword by Jim Craig costs £8.99 and is published by Apex. ISBN 1-904444-34-2. Check out what you think you know about Celtic FC with the help of the 1,500 questions in this book. There are plenty of facts and figures to boost your brain if you don't fancy testing your knowledge. The Motor Neurone Disease Association Charity will receive £1 for every copy sold from the author and publishers. £1 from every copy of the book sold is being donated to The Motor Neurone Disease Association. 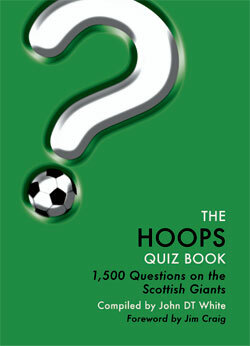 To celebrate the launch of the new Hoops Quiz Book, the Derry News has a copy to give away to one of our lucky readers. To get your hands on a copy, just answer this question - How many appearances did Paul McStay make for Celtic? Question - How many appearances did Paul McStay make for Celtic? £1 from every book sold is being donated to The Motor Neurone Disease Association (MND). 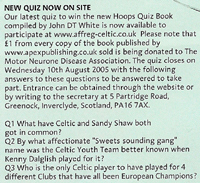 Our latest quiz to win the new Hoops Quiz Book compiled by John DT White is now available to participate at http://www.affreg-celtic.co.uk. Please note that £1 from every copy of the book published by http://www.apexpublishing.co.uk sold is being donated to The Motor Neurone Disease Association. The quiz closes on Wednesday 10th August 2005 with the following answers to these questions to be answered to take part. Entrance can be obtained through the website or by writing to the secretary at 5 Partridge Road, Greenock, Inverclyde, Scotland, PA16 7AX. Q1 - What have Celtic and Sandy Shaw both got in common? Q2 - By what affectionate "Sweets sounding gang" name was the Celtic Youth Team better known when Kenny Dalglish played for it? Q3 - Who is the only Celtic player to have played for 4 different Clubs that have all been European Champions? At last a horror quiz book you can really sink your teeth into. An essential buy for any self-respecting gore hound. Full of thrills, chills and (blood) spills. I remember the days of standing on a terracing huddled round a friend reading out the half-time quiz in the match programme. The answers on the tip of your tounge. Turning the programme upside down to reveal the answers. Finding you answer was way off and just how much you had forgotten. John neatly rekindles these memories, with a quiz book that will be a hit for Celtic Supporters no matter what age. No matter how far their memories go back. The book was a trip down memory lane for me. I first saw Celtic in the Lisbon season and listened to my Dad and Uncles rhyming off Celtic line ups from the 1940s and 1950s. I now do the same with the Lisbon Lions and Centenary teams. The book allowed me to test my Celtic knowledge and memories. Then there was the many a trips into the attic to search programmes and books for clues. No way did I need the answer section. Or did I...? Radio Forth 97.3 FM reviewed 'The Hoops Quiz Book' compiled by John DT White on 'The Super Scoreboard Programme', they also gave copies of the books away in a radio competition. Having been a Celtic fan all of my life, and having had the pleasure of working with Jimmy Johnstone and the Lisbon Lions over the past 3 and a half years, I thought I knew all there was to know about Celtic. Having read John's Quiz Book I now know just how wrong I was! I am also delighted that MND are benefiting from sales of the book. A fountain of knowledge about past and, no doubt, future Scottish champions. Learn what you didn't know about the first Scottish and British club to ever with the European Cup. Remember Bobby Lennox, Jimmy Johnston, Billy McNeill, Charlie Nicholas and many more legends. If it makes Glasgow Celtic tick its in this superb quiz book! Mastering the pub quiz and scoring a few goals for charity - just two reasons why this book should be on every Celtic fan's reading list. Great read, especially as I travel for most home games. Obviously really well researched, there are questions for all ages. Lots of categories to choose from - this book will be a valuable source of entertainment and knowledge for even the most ardent fan. Ideal read for boys, girls and adults alike, covering just about everything you want to know about Glasgow Celtic. One could do worse than fork out £8.99 for this book. £1 from each copy sold goes (laudably) to the Motor Neurone Disease Association, but it is in any case a good book for dipping into when life gets boring, or if there is someone on the supporters' bus or in the pub who really need to be quietened! There are 1500 questions and I would imagine that anyone who gets 1000 of them is really doing very well indeed. Take for example the very last question. Who knew that Alec Boden played for the Welsh League against the Scottish League in 1952? Not a lot, I imagine. The questions are based on players, managers, seasons and simply general trivia. Some questions are abstruse, and there is a certain amount for the historians among us like a bizarre one, for example, about Sniper McColl being Europe's top goalscorer in 1915/16! Sandy McMahon was, apparently, the first player to score in two successive Scottish Cup Finals in 1899 and 1900. And how well do you remember Daniel da Cruz Carvalho Dani? All this and a great deal more in this excellent book. The only criticism I would make is that it could perhaps do with a picture round or two, simply to break things up, but for the "geeks" among us, it is a superb publication, and it is not too early to approach Santa Claus to include this book in your Christmas stocking. A great initiative, particularly for Celtic supporters overseas. Hours of fun for all - from Anchorage to Zagreb! The only book that has Celtic supporters jumping through hoops.